Well....it certainly seems like it has been for-e-ver since I did a YOP post. In all honesty, things have been so disorganised and upside down that my mind hasn't been on the job. Funny that when I look at what I've completed so far, it's mainly the knitting projects. After the mammoth task of sock knitting, a good dose of crochet was needed and I thought I would get back on with my vintage throw. I put this aside originally, as I was put off by having to read the chart to find the next colour, somehow while my project hibernated this became a HUGE thing in my head, so it has been a lovely discovery to get back on and enjoy every stitch. So....my list....how is it going? Ipod Hoodie - I think these may be a good pressie, so if it is straightforward then I may make a few. Fingerless mitts - maybe these ones? Another blanket - are you seeing a pattern? 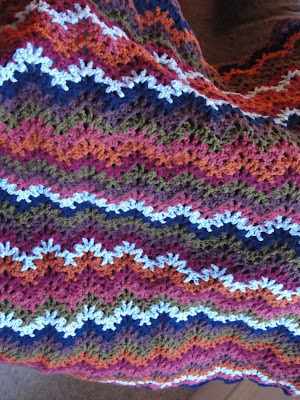 I have a vintage crocheted throw on the go, which I must finish and also from many moons ago, the famous Boring blanket, which proved so boring, it is still not finished! So maybe not as far ahead as I should be....but then this is all about enjoyment. These past couple of days, I have been starting to organise a new crafting room....my fabric, yarn and painting things have been packed for near enough four months, so it an absolute dream to find my things a home. I have been rather scared by the amount of yarn I have, but it is lovely to see it all in one place (even if it doesn't fit as beautifully as I would like....shoehorned is definitely the word!) I am hoping that this step into settling will mean I feel a little less overwhelmed and a little more at home. To catch up with all the other yoppers, take a look at the ravelry group page. I'm so glad to hear that things are coming together for you now. My own YOP went by the wayside ages ago, I'm too much of a butterfly brain for all that planning. You are doing brilliantly and I love that blanket, it's going to be stunning. Wow what a wonderful array of projects you have finished, have on the go or want to make. I love the vintage throw you are working on, the colours are gorgeous. Faith, you are getting so much done and as far as I am concerned you can never, never have too much yarn. Yarn diets don't work, so enjoy the beauty of every skein. Faith! You have accomplished a ton this year! I bet unpacking a craft room will be just the thing to feel more settled in your new home. Do you guys miss farming? I bet it feels nice to see how much you've already accomplished for the YOP challenge. I've been contemplating setting a little space aside for my crafting ... where oh where? 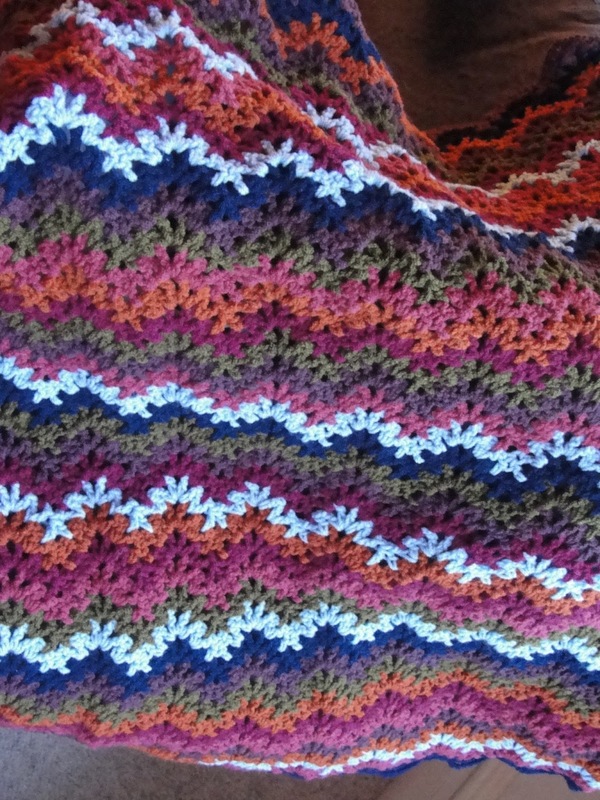 That crochet st is so fun and neat! You're doing far better than me!!! I think I've kind of abandoned YOP ... maybe next year. I have discovered that my stash fits into four of the five drawers of a very large/tall chest of drawers ... so I still have another drawer to fill hehe! Your list is so ambitious - and how do you manage to be so productive? Such a pretty blanket. It's so nice to come back to a dreaded project and find that it's fun after all. Your throw is so pretty Faith and I love the colour choices...really lovely! You seem to have already completed quite a lot of projects on your very long list there...well done! Thank God I'm not the only one! Is it Spring or a virus of some kind or just that "nesting" instinct like the birds get? I've been organizing and cleaning and ignoring those big old blanket projects as I'm tired of them and I can't afford all that yarn right now either! I'm veering off my list and doing little projects and tidying up around this place after a long Winter! Is it wrong? What was I thinking with all those blankets on my YOP list? I went nuts! LOL! I love your vintage one...I do have a thing for blankets but not the budget for them. I've never read a chart before...where have I been? But I have done too pairs of socks but one pair is too small but I am a better knitter than when I started the YOP list so hats off to all of you for encouraging and inspiring me! You've gotten lots done on your list! Tell me....that owl you made...it wasn't the big white one on the Purl Soho blog/site????? I love that owl! That was what inspired me to learn how to knit so I could make it some day! It will be on the YOP list next July for sure! Top of the list! If that's the one you made...please tell me about any "problem" areas because if there are any I will SURELY find them! Ha! Ha! Do you think I could handle that owl now? Am I a good enough knitter yet? I have the pattern printed out so I should go read it and see if it makes more sense to me now. I've come a long way, baby! LOL! Have a great weekend! It's lovely, I could see why you picked it back up. I've had trouble jumping back into YOP this year, too. Love the blanket, the colours you've chosen for it are fab. So much has been accomplished on your list this year well done. I'm not sure how I missed this update and indeed your last few so I'll catch up now (I'm way behind on blog reading so that may be why). Love pirate Jack for world book day and you did great with all those requests at the last minute and your socks are just fantastic well done on completing them, I'm only just done one and have the other cast on lol.